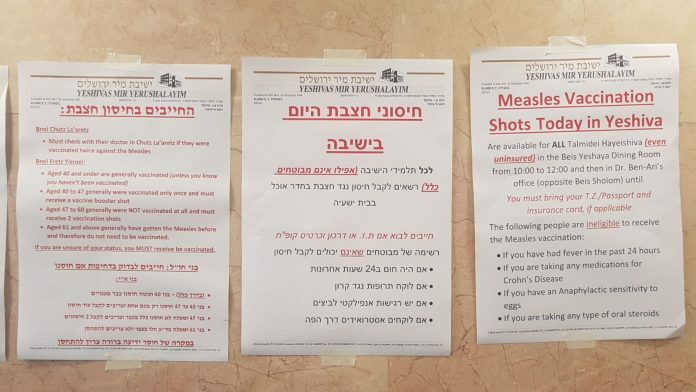 After eight students were hospitalized after contracting measles, medical teams arrived at the Mir yeshiva this morning to offer vaccination for everyone, regardless of whether they had insurance or not. 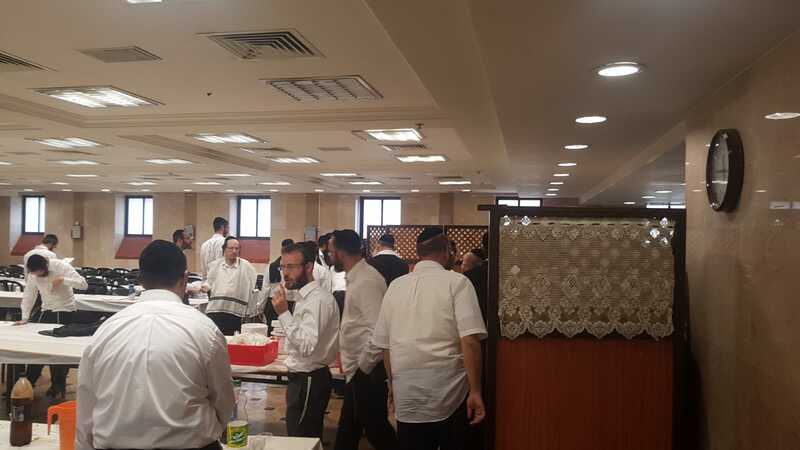 A medical staff arrived at the Beis Yeshaya dining room to administer the shots to anyone who had not yet been vaccinated. All students needed to do was bring their identity cards or passports. Hundreds flocked to the dining room to receive the required shot. The recent outbreak of measles is causing great concern in Israel and around the world. Moshe Bar-Siman Tov, Director-General of the Ministry of Health said this morning that 1,340 people have already contracted the disease, 99% of whom were not vaccinated. 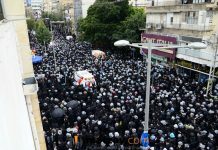 “Although we’ve done a lot of things recently, every day we hear about more contagion and more people who have been exposed,” Bar-Siman Tov said. It would’ve been better if people had been vaccinated and immunized before this outbreak (obviously), but hopefully the fact that people are taking it seriously now and getting the shot will slow and eventually stop this outbreak. The fact that they are getting the vaccine now seems to indicate that they aren’t anti-vaxxers, they simply didn’t think it was a real risk or could happen to them until they saw their chaverim getting sick. We can assume that most of these bochurim were vaccinated as children as per schedule. Why aren’t they immune? Why do they all need boosters? What does that say about the effectiveness of the vaccine? Keep vaccinating and watch the measles spread like fire. Research reveals that a vaccinated individual not only can become infected with measles, but can also spread it to others who are also vaccinated against it – doubly disproving that the administration of multiple doses of MMR vaccine is “97% effective,” as widely claimed. Comparative data provided by the U.S. Centers for Disease Control and Prevention (CDC) and the Vaccine Adverse Event Reporting System (VAERS) reveal that nobody has died from measles in more than 10 years, while at least 108 deaths reported in VAERS during the same time frame have been linked to measles vaccines. Dear 9:06am, your mental institution did an excellent job teaching you how to cut and paste from tinfoil hat websites! I doubt it, but if it’s true, it would be because measles is so rare. Now with the increasing numbers of the anti vax crowd and the mouth breathers that are not vaccinated, the deaths from measles are increasing, the numbers will change. I know, math is hard. Really! I did not find this report any where nor has the cdc sent me any such reports even though they send me many others about benefits and risks of all sorts of vaccines all the time. If you did see such a report please post the link thank you and don’t quote hearsay. You are spewing the unmitigated garbage of the anti-vaxxers, which has been debunked. The “108 deaths reported in VAERS” in past 10 years have not been linked to measles vaccines, but to people trying to blame vaccines. If you read the VAERS ‘reports’, they are nothing more than people (parent, brother, friend) saying that someone had a vaccine at some point, and then later died. Most of the time the vaccines were taken when the person was already ill, or the parents refused to give proper medical care to other complications. They are not Doctors reports, just a list of sad cases of deaths, where grieving people are looking to blame someone. The Beis Din is already out on this, Everyone is to get vaccines. Case closed. Dear Hoax, if you are completely ignorant in the subject matter, you are better off not embarrassing yourself with gibberish. If you actually read the notice, you will see that depending on the person’s age, many in E”Y were not vaccinated in accordance to today’s schedule. Nowhere in the article does it indicate the ages of the infected persons. So as usual anti-vaxers base their ignorance on wrong assumptions. Nebach. I never realized how many young sheeple there were. These sheeple verify their doctor’s word with snopes (who brings down beferushe CNN and such kinds) and it becomes toiress moyshe misinei. Those who don’t follow their conclusion are rodfim and rotzchim. are you saying frum doctors are ignoring the safety of their patients for profit? Dear 9:14am, your antivaxxer gibberish perfectly matches your ignorance of English and Loshon Hakodesh. Dear Brainwashed Antivaxxer, you must follow the tinfoil hat websites like a good little sheep that you are(or should I say lemming?). Why else would he keep rebleating the same debunked garbage? Baaaaah, worldwide governmental conspiracy! Baaaaahhh, worldwide doctors plot! What is a tinfoil hat? If it’s real tinfoil it won’t last. Tinfoil is very flimsy. Why must one wear tinfoil as a hat as opposed to a shirt or shoes? 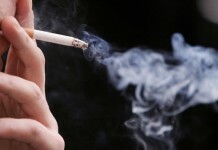 to keep the toxins out of the brain to prevent autism of course! 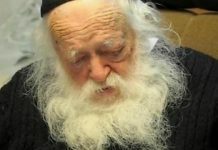 An 18 month old baby just died of measles in Yerushalayim. Your assertion that nobody dies is flat out false. The 18 month old baby arrived at the hospital unconscious and was positively tested for staf and measles- he could have just died from staf why is it being blamed on measles? Obviously there is some kind of agenda here! 2. We shouldn’t believe that all over the world outbreaks and rises in diseases happened after mandatory vaccinations because we shouldn’t believe anything on the internet. 3. We shouldn’t listen to real MDs and PHDs who have true to life experience with vaccines because obviously if they are against vaccines, they are holistic. 4. We shouldn’t believe researchers who are coming forth and saying the ingredients in vaccines are toxic and the doses are outrageous because we shouldn’t believe what we see on the internet. 1. The FDA and CDC who are making millions off of vaccines. 2. The anti-vaxxers who keep coming back with inferior language and no proofs. Dear misinformed antivaxxer, don’t believe anyone, just study some high school level biology. Until you do, pretend to be smarter by not talking about subjects you have zero knowledge about. so frum docters are poisoning jews everytime they give a vaccine? Both of the baby’s parents tested positive for measles. The most common cause of death from measles is actually pneumonia which is a secondary infection caused by measles. Several strains of Staph bacteria can be present in those suffering complications from measles. That is why they are blaming the baby’s death on measles.